we went horseback riding this morning! it was really awesome :) i'm thinking we'll just be doing these trail rides every weekend until we move because it doesn't look like they'll start up a beginner class in time. i might check out another barn, but this one is really close to where we live, which is great. today's review is of the last two polishes i purchased from the China Glaze 2012 Hunger Games collection... the others just didn't blow my skirt up :) the base color is Smoke And Ashes, a deep green with a subtle green shimmer (with the slightest bit of gold). the shimmers are not super prominent, but they add depth to the polish and in the sun they are absolutely stunning. the best thing about this one is... one coat for full opacity! i did add two coats of Seche Vite to really show off the sparkle. 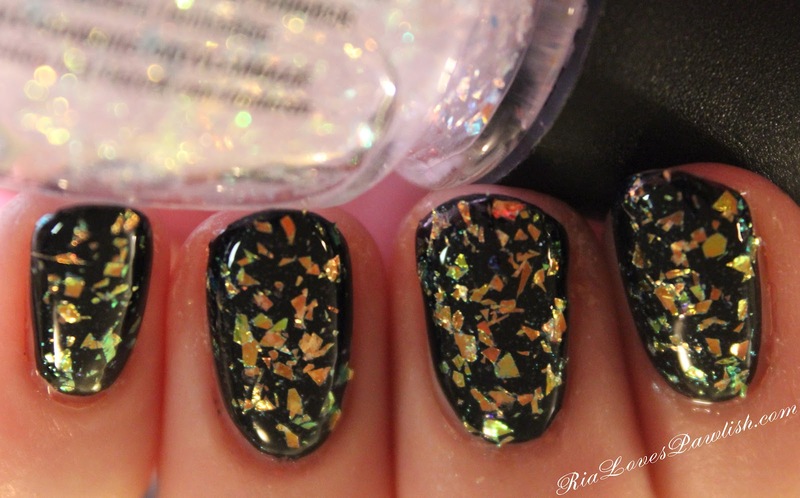 Luxe And Lush is a great flakie of the mylar flake variety. it's divine!! check out the difference between this and a traditional flakie here. 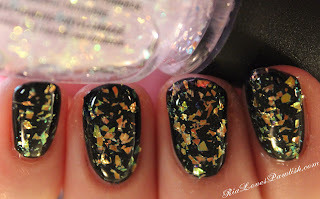 it flashes gold and green and pink and champagne... if you like flakies, you'll LOVE this one. one coat Seche Base, one coat Smoke And Ashes, two coats Seche Vite. one coat Luxe And Lush, two coats Seche Vite. I love the way Smoke and Ashes looks. It's beautiful! it's such a great update to a basic black nail!